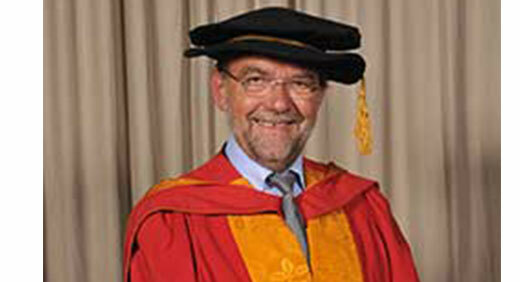 A pioneering geneticist who invented DNA fingerprinting has received an Honorary Degree of Doctor of Science from the University of Wolverhampton. Professor Sir Alec Jeffreys was presented with the award from the Faculty of Science and Engineering at a ceremony on September 11. Professor Sir Alec was one of the first to discover inherited variation in human DNA, then went on to invent DNA fingerprinting, showing how it could be used to resolve issues of identity and kinship. This revolutionised forensic and legal medicine, and has impacted on the lives of millions of people worldwide. His award was conferred in recognition of his outstanding scholarship in molecular genetics; the development of DNA profiling and significant contribution to widening participation in sciences. He said: “I am absolutely delighted and very proud to receive this wonderful recognition from the University of Wolverhampton, especially as the award coincides with the 30th anniversary of our very first DNA fingerprint. Professor Sir Alec studied biochemistry and genetics at Merton College, Oxford. Following an European Molecular Biology Organisation (EMBO) Postdoctoral Fellowship at the University of Amsterdam where he was one of the first to discover split genes, he moved in 1977 to the Department of Genetics at the University of Leicester where he held the positions of Professor of Genetics and Royal Society Wolfson Research Professor until his retirement in 2012. His more recent work concentrated on developing new approaches to analysing variation and mutation in human chromosomes.